It’s been 40 years since the publication of Gordon Korman’s first novel for young readers (written when he was just 12 years old), This Can’t be Happening at Macdonald Hall. Who would have thought it would take that long for Korman’s stories about a couple of lovable troublemakers at a prestigious boy’s school to make it to the screen? 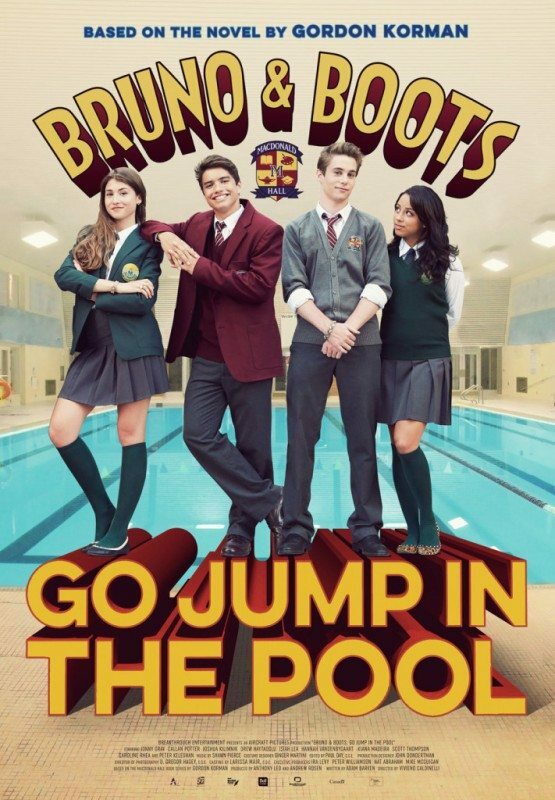 Produced by Aircraft Pictures and premiering on YTV April 1, Bruno and Boots: Go Jump in the Pool brings Macdonald Hall and its students to life. The TV movie, filmed in Hamilton, stars Jonny Gray and Callan Potter as the title duo, Peter Keleghan as the headmaster, and Sabrina the Teenaged Witch alum Caroline Rhea as the headmistress of the nearby academy for girls. Q&Q caught up with Korman during his recent visit to Toronto to ask him about his decades-long career and the enduring appeal of Bruno and Boots. What is it like for you to see your work adapted for the screen? 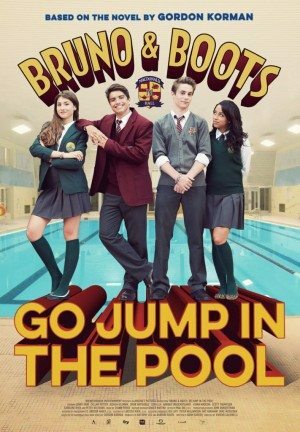 I’ve had a couple of experiences with TV adaptations of my books, but I have to say that Go Jump in the Pool was an almost surreal experience. The instant I saw a snapshot of Bruno and Boots, I was stunned at what a perfect match they were for the characters I created when I was a kid. Did you have a fair amount of input in the TV movie? Aircraft Pictures kept me in the loop through pretty much every stage of development. But I tried to keep my influence to a minimum. In the end, this is not the book; it’s a film inspired by it. It has to succeed on its own merits. And it does – beyond the wildest dreams of my 12-year-old self. Obviously, there were ways in which the movie went in different directions than the original book, but I understand and agree with all those decisions. How does the movie differ from your book? I guess the biggest difference is Miss Scrimmage. The idea of a hyper-anachronistic young-ladies-must-have-perfect-manners finishing school would just be bizarre to today’s kids. So we reinvented Miss Scrimmage’s as an ultra–New Age, experimental, almost Zen school. The amazing thing is that despite that change, Cathy and Diane stay exactly the same, and fit in perfectly. It’s been 40 years since you wrote This Can’t Be Happening at Macdonald Hall. Why do you think the book – the series, really – has had such enduring appeal? Honestly, I can’t answer that. I’m just beyond thrilled that it’s true. If I had to guess, I’d say it has something to do with the enduring nature of friendship. Technology changes, the world changes, but the experience of being a best friend stays the same. I think it always will. The world is much different now than it was when you were 12. Absolutely, I’d write Macdonald Hall very differently today – and I’d probably ruin it. I was so much closer to the ages of my characters and readers back then. I’ll never have those instincts again. I love the books I’m writing now, but there’s something in the work I did as a teenager that I can’t tap into anymore. You’ve been incredibly prolific in your career. How do you come up with so many ideas? As an only child, I kept myself entertained by being creative. That’s how I look at my job today: I get paid for making things up. What’s coming up next for you? Mostly, I’m going to keep on writing. I’m in the middle of a trilogy – Masterminds – and I have two more books coming out in 2016 – Slacker, a stand-alone novel, and Jingle, which is a Christmas/holiday book connected to my Swindle series. You’ve spent most of your life as an author. Have you ever thought, “That’s it, I’m done. Time to try something else”? Seriously? Am I qualified to do anything else? It’s astounding (and wonderful) to me that, at age 52, I’m attending the premiere of a movie based on a story I wrote the summer after Grade 8. Yet, at the same time, I honestly feel that my best work is still ahead of me. Mick Jagger once said he couldn’t imagine singing “Satisfaction” at age 45, and he continues to do it as a septuagenarian and a peer of the realm. I’m totally comfortable with the idea of continuing to write companion novels to my Grade 7 English assignment.